Colourful designs in Art Deco style by Ritter & Cie, Prague, whose trademark is a Pegasus on the Ace of Hearts. Some of the items held by the court cards are not quite standard. “Ritter & Cie" had already been acquired by Ferd. Piatnik & Söhne in 1899 but the original name and trademark were continued. 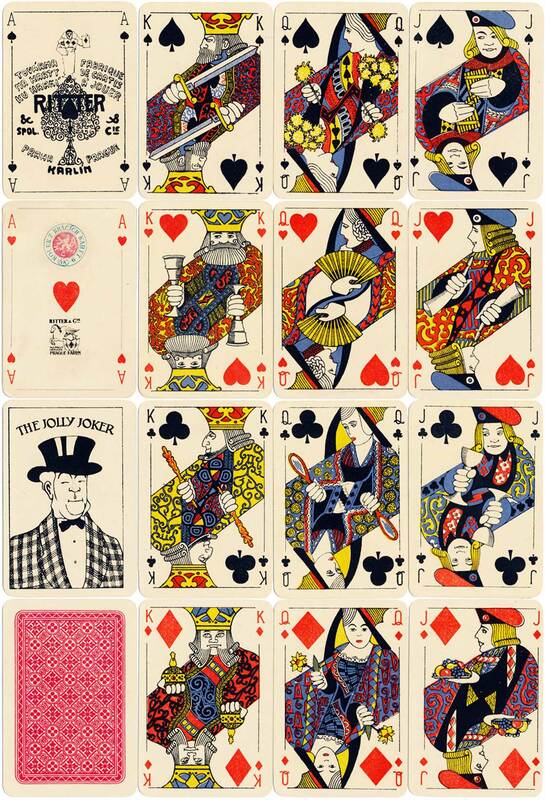 Above: Art Deco style playing cards by Ritter & Cie (alias Ferd. Piatnik & Söhne), Prague, 1933. 52 cards + Joker; 74x49 mm. The artist's name is not known. Images courtesy Barney Townshend. All images on this page from the collection of Barney Townshend. 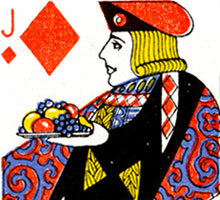 • See also: 'Jugendstil' designed by Artuš Scheiner, 1920 • Czech Nationalistic • Eagle Playing Card Co., Ltd.